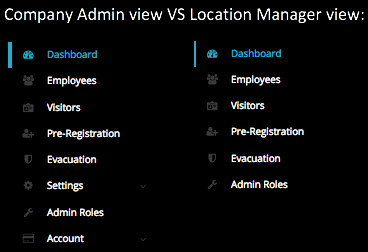 Admin roles are assigned to employees that require access to the SwipedOn web dashboard. These roles are comprised of company admins and location managers. A 'Company Admin' role elevates the privileges of a user and allows them to configure company wide changes. A company admin has access to ALL settings within the SwipedOn web dashboard. A 'Location Manager' allows for lower level privileges meaning a location manager can only perform basic functions and does not have access to any of the 'Settings' or 'Accounts' tabs. A 'location manager' can create and assign additional Location Manager roles only for the location that they have been assigned. Where can I configure admin roles? Navigate to the 'Admin Roles' tab on the left of the screen. Create a role by selecting the 'Add Admin Role' button located in the upper right corner. If selecting 'Create Employee with Admin Role', please be aware that any roles created here will also show in the 'Employees' tab on the left of the screen and on the iPad for visitors to select from (if employee host selection is enabled). If selecting 'Choose from Existing Employees', you will be able to search for an employees details that are already uploaded as an employee and assign them a company admin or location manager role. *Please note, when an account is first created with SwipedOn, the email address used to register the company is automatically elevated to a 'company admin'. There must be at least 1 'company admin' associated with the SwipedOn account. A Location Manager cannot create or assign the Company Admin role to another employee or Location Manager. If a Location Manager signs in at another location associated with the same account, they will then become a location manager for the location they have signed into.